Kylian Mbappe has arrived. 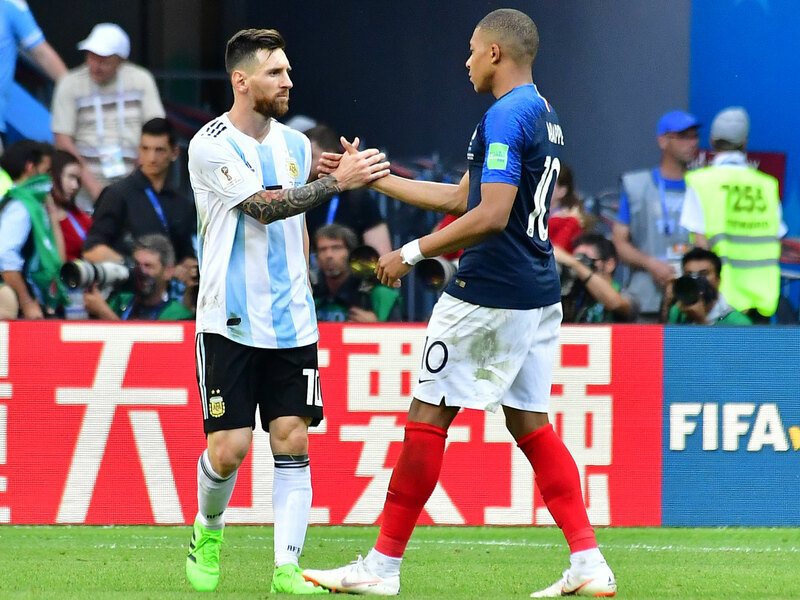 The France star was dynamic in a 4-3 win over Argentina in the World Cup, helping carry Les Bleus to the quarterfinals with a performance that was well beyond his 19 years of age. KAZAN, Russia – If that is it for Lionel Messi’s hopes of winning a World Cup–and he will be 35 by the time the next tournament comes around in Qatar–at least he went out in a classic, a 4-3 thriller that featured two goals of unimpeachable quality and will live forever in the collective memory of the World Cup. But if it marked the end of one era, it perhaps also marked the shift to a new one, as Kylian Mbappe confirmed his immense talent. That £166 million for which Paris Saint-Germain agreed to sign him last summer suddenly looks a lot more reasonable. The Argentina defense cannot handle even moderate pace, and Mbappe is lighting fast. All France had to do was defend moderately well and hit balls over the top. It was something of a mystery that the game remained as close as it did for so long. This Argentina has been a shambolic side from the start of the tournament, and for Mbappe, it was the perfect victim. Whether France actually has found a coherence that had been lacking in the group stage or whether it just capitalized on the shortcomings of its opponent will only be seen in the quarterfinal. It was clear from the very start that Argentina could not handle Mbappe. After 13 minutes Ever Banega miscontrolled 30 yards from the France goal. Mbappe picked up the ball and ran. Banega couldn’t catch him and neither could Javier Mascherano. Mbappe swept by Marcos Rojo, who did catch him, but only by using his arms to haul him down. It resulted in a clear penalty that Antoine Griezmann rolled in. What followed was a game of extraordinary drama, one in which it seemed mystifying that France was ever in danger. Argentina may have been a mess, but its will to survive and endure is remarkable. Angel Di Maria lashed in a brilliant equalizer from 30 yards four minutes before halftime, and three minutes after the break, a Messi shot was redirected in by Gabriel Mercado. Briefly, there was a thought that Argentina might somehow cling on, that it might somehow rekindle the spirit of 1990 when it produced dogged win after dogged win. It did not last long. Argentina’s right flank was an open door all night. A cross from the left evaded everybody until it reached Benjamin Pavard, who almost caressed a curling volley into the top corner. Then it was Mbappe’s turn. A cross from the left, a sharp turn and shot and a goal from the sort of predatory instincts that mark out the best finishers. Then, four minutes later, after another forward charge into space, a neat touch from Olivier Giroud and a calm finish, Mbappe became the first teenager since Pele in 1958 to score two goals in a World Cup knockout tie. There was still time for Sergio Aguero to pull one back, but this was France’s day, and specifically Mbappe’s day. There will always be skepticism about those who play in the French league, even if they score 13 league goals in helping their side to a domestic treble. But this, after his performances for Monaco in the Champions League in 2017-18, confirmed him not merely as a player of the highest potential but of the highest quality. Didier Deschamps, after the prickliness of the first couple of weeks of the tournament, cut a far more relaxed figure, joking about the fact Mbappe was born in 1998, five months after France, under Deschamps’s captaincy, had won the World Cup. That last line was presumably said in jest, although with Deschamps it's often hard to be sure. This, though, was a far more relaxed Deschamps than he has been over the past two weeks, and he was even prepared to indulge comparisons of Mbappe and the Brazilian great Ronaldo.